BACKGROUND: Obesity is an increasingly common condition with serious associated morbidity and decreased life expectancy. Swedish adjustable gastric banding (SAGB) is effective in inducing weight loss, as well as being minimally invasive, totally reversible, and adjustable to the patient’s needs. CASE REPORT: A 23-year old morbidly obese (BMI 40) female patient underwent adjustable gastric banding with the Swedish band (SAGB). Early in postoperative follow-up, she developed injection port infection. Injection port removal was required, and band tube was left in abdomen attached to fascia near port. Shortly after port place healed well. Three weeks after she was admitted in local hospital due to right low quadrant pain and fever. Lab findings show leucocytosis and US revealed free liquid in right lower quadrant and noncompressible tublelike structure in abdomen. Laparoscopic exploration is performed and circumscript peritonitis with tube in it is found. Apendix was inoccent. They drain pus, bring tube out of abdomen on laparoscopic incision and left apendix. The patient recovered with no postoperative complications. Shortly after new injection port is placed due laparoscopy and connected with some band tube on the orginal place. The current patient BMI is 28.3, and she is well without any current complication. 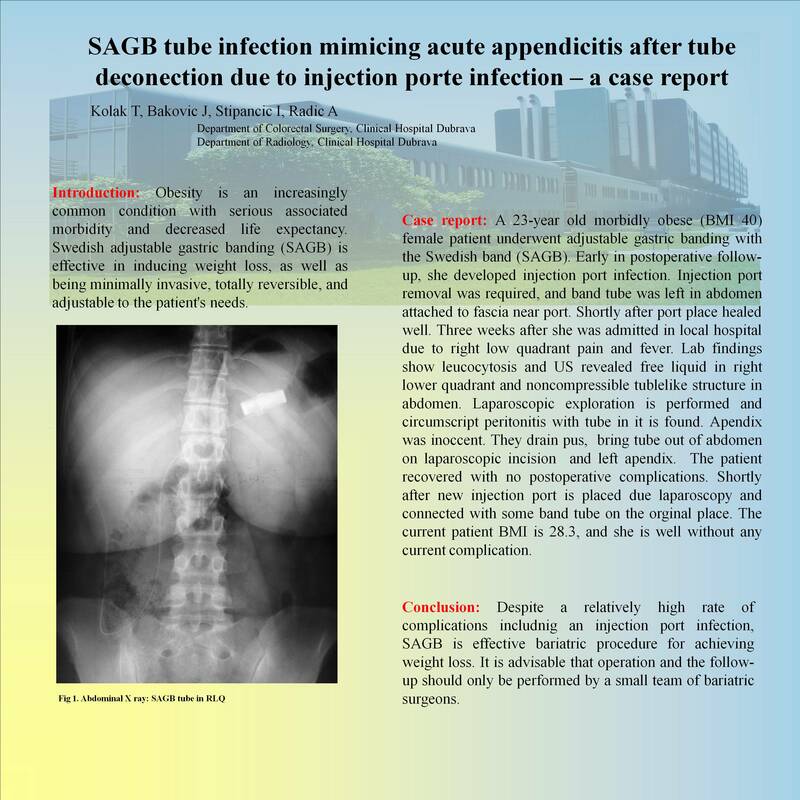 CONCLUSION: Despite a relatively high rate of complications includnig an injection port infection, SAGB is effective bariatric procedure for achieving weight loss. It is advisable that operation and the follow-up should only be performed by a small team of bariatric surgeons.